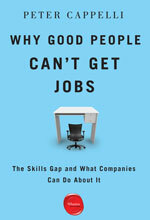 Wharton management professor Peter Cappelli’s most recent book — Why Good People Can’t Get Jobs: The Skills Gap and What Companies Can Do About It — has inspired a reaction from just about every group with a stake in today’s workforce: employers, employees, recruiters, academics and media commentators. Cappelli debunks the oft-repeated argument from employers that applicants don’t have the skills needed for today’s jobs. Instead, he puts much of the blame on companies themselves — including their lack of information about hiring and training costs — and on computerized applicant tracking systems that can make it harder, not easier, to find qualified job candidates. Cappelli, who is also director of Wharton’s Center for Human Resources, sat down with Knowledge@Wharton to talk about his book. Below is an edited transcript of the conversation. Knowledge@Wharton: Peter, thanks for joining us. You cover a lot of ground in this book, but one of your themes is that, given the weak economy and bleak job market, companies have a bigger pool of job applicants to choose from and, therefore, can be much more selective in hiring. Yet these companies still claim that they can’t find candidates with the requisite skills. Can you talk about that? Peter Cappelli: I think it’s important to remember that employers control everything about the process. They define the job, they create the requirements for the job, then they decide how the word gets out to people, recruiting-wise. They set the rate of pay, which helps determine how attractive the job is, and then they handle the selection part where they look at the applicants and sort them out. The obvious point is that there just aren’t enough jobs to go around right now, so employers can certainly be picky. But we’re not really talking about being picky here. It’s not surprising that employers might actually search more, and it might take them longer to hire now, because there are so many candidates to look at. Why grab the first one when you have this long queue that you could look at? But the unusual thing, and certainly the negative thing, from everybody’s perspective is those employers who say, “Look, we’re just not hiring, or we’re waiting a very long time to hire, because we can’t find what we want.” I think the place we have to begin to answer that question is back with the employers who are making all those decisions about the process. Are they doing anything wrong? Knowledge@Wharton: Well, clearly they are, because there’s this mismatch between people looking for jobs and employers saying they can’t find people to fill them. I think one of the issues that you raise is what you call the Home Depot view of the hiring process, which basically says that filling a job is like replacing a part in a washing machine. You simply find someone who does the exact same job as that broken part, plug him or her into the wash cycle and that’s it. But some companies feel they don’t have to fill that vacancy and can put the work on existing employees. So they don’t really know when the existence of too many unfilled positions begins to hurt their business — their expansion, their profitability, their competitiveness, whatever. So, isn’t that part of the problem? That companies delay hiring employees and don’t realize the hidden costs of doing so? Cappelli: That’s certainly part of the problem — that the internal accounting systems in most organizations are so poor that they can’t tell what it costs them to keep a position vacant. They easily know how much it costs to employ somebody, but they can’t measure that employee’s contributions. So, in most companies, given their accounting systems, it actually looks like they’re saving money by keeping positions vacant. If you think that’s the story, then you’re obviously in no rush to hire. I think it starts there, and that’s clearly not a good thing for society or for employers. But it begins with their own problem: The way their internal accounting is designed encourages them not to hire. Knowledge@Wharton: You also say part of the problem is that companies aren’t paying market wages. They’re trying to low ball the job market. But why should they pay market wages when they can get employees cheaply? Cappelli: Well, the thing is they can’t — that’s what they’re claiming, right? There’s a survey done by Manpower that asks employers if they’re having trouble finding people to hire. In that survey, about 11% say the problem they’re having is they can’t get people to accept the jobs at the wages they’re paying. So 11% are saying we’re not paying enough. If 11% admit this, my guess is the real number is probably double that. We’re not very good at identifying problems that we create ourselves. That’s certainly part of it. You know, maybe you can’t blame them for trying. But if they’re not finding [employees], don’t call it a skills gap; don’t call it a skills mismatch — you’re just being cheap. Knowledge@Wharton: One of your chapters in the book is called “A Training Gap, Not a Skills Gap.” You have some figures showing that in 1979, young workers received an average of two and a half weeks of training per year. By 1991, only 17% of young employees reported getting any training during the previous year, and by last year, only 21% said they received training during the previous five years. You note that this especially hurts work-based training programs, such as apprenticeships. So, really, a huge part of the so-called “skills gap” comes from the weak employer effort to promote internal training for either current employees or future hires. Is that correct? Cappelli: Right. I think the story that one hears, particularly around the policy community, is that employers can’t find the people they want to hire because schools are failing and kids aren’t coming out with the right academic degrees and the right knowledge. If you actually look at the data from employers themselves when they report problems they’re having with recruiting, they never talk about academic skills as being near the top of the list. In fact, their complaints have been consistent for the 30 years or so that I’ve been looking at this. And their complaints are the ones, frankly, that older people always have about younger people — they’re not conscientious enough, their workplace attitudes are not diligent enough, they don’t want to work hard enough — those sorts of things. They’re not actually looking for young people out of school at all. When you look at what they want, they want experience — everybody wants somebody with three to five years’ experience. What they’re really after are the skills that you can’t learn in a classroom, that you can only learn by doing the job itself. So, the craziness about the hiring requirements is that in most cases, employers are looking for somebody who is currently doing exactly the same job someplace else. That’s partly why they don’t want to look at an applicant who is currently unemployed…. They want somebody who is currently doing the same job right now. The problem is that nobody wants to give those people right out of school any experience. Nobody wants to take somebody who’s never done this job before and train them. Now, I can understand why it’s better, easier, if you’re an employer to hire somebody who’s already been trained — or it seems like it’s better. But it’s creating this skills problem, because nobody wants to give people that initial experience. And again, in many cases, it would pay off to take people who are really qualified in many ways — except for these quite specific skills — and help them get training. You can pay them less while you’re training them. You can require that they get some of these skills before you engage them. But because of the accounting systems, employers, for the most part, have no idea what it would cost them to train somebody. They have no idea whether they’re actually saving money by trying to chase these people who already have jobs and hire them. Knowledge@Wharton: It’s one of the Catch-22s that your book seems to be filled with. Employers don’t want to train their employees because they fear they’ll leave the company — which employees are actually doing more and more frequently these days — which means all the effort and expense of the training process will be wasted. But that means it’s increasingly heard for employers to find trained job applicants. It seems like there’s an impasse here. Knowledge@Wharton: You mentioned that there’s discrimination against unemployed job applicants for a number of reasons. Maybe companies feel they aren’t up to date on their skills, maybe they’re older workers. So, is there any way around this, short of federal regulations that bar such discrimination, which would no doubt be difficult to enforce? Cappelli: The older worker issue is particularly important because for the most part, older workers have everything that those employers say that they want in new hires — better work attitudes; experience doing the work; they don’t need ramp up time; they don’t need training — or they don’t need as much — and yet, there’s still widespread discrimination against older workers. There are laws against it and yet, it still seems to happen. I think the problem begins with employers understanding their own self-interest. I think that’s the irony here. I’m not making any argument that employers ought to do something simply for the social good. But it’s just not in their interest to do what they’re doing now, which is to chase the same small group of people who already are employed someplace else. It makes sense to train people. It makes sense to give people a chance. It makes sense to be more realistic about what your job requirements are so that you can actually fill the positions. I think that’s the real puzzle about all of this — that employers are not doing what’s in their self-interest. So, how could they get better at this? Well, maybe they could get help from people outside, and that includes the academic world, to just point out how expensive it might be to simply chase outside hires all the time. For example, our colleague here, [Wharton management professor] Matthew Bidwell, has done an interesting study comparing people who were hired from the outside to people who were promoted from within. People who are promoted from within do much better on cost and productivity accounts — which doesn’t mean you should never hire from the outside. But it certainly can pay off to develop from within. So, I think that employers have to begin with better information. And the irony about this is if you look at any other aspect of their business — such as how much each supplier contributes or what the costs are of having [inadequate] inventory are — they have incredible detail about it. When it comes to people, they have got no idea about any of these things. Knowledge@Wharton: Has the role of the typical company HR department been enhanced, minimized, made irrelevant in this hiring process these days? Cappelli: I think that part of the story is that the HR departments have been gutted over the last 20 years. Particularly in this recession, there’s a lot of downsizing, but especially in HR. The training departments are largely gone out of most companies, and a lot of the recruiting functions are gone as well. So, in the old days, you ask a hiring manager to create a job description. There would be an HR person there to help him do it or to push back if they had requirements which were crazy or out of whack with the market. Now those folks are gone, and basically, those wish lists of hiring requirements get baked right into applicant tracking software. Human eyes rarely see applicants until the very end of the process. So, we’re trying to push the automation too far. There’s nothing wrong with the automation, per se, and you need to screen all these applicants. But trying to get rid of the people altogether means that we’re relying on the machines to make the decisions. Human judgment is still pretty important. Knowledge@Wharton: Also, a lot of applicants for jobs have learned how to game the system in terms of putting in the key words they need to add to their resumes or cover letters — whatever. So, it seems like as sophisticated as these software systems are, there are ways to get around them. Cappelli: Right. I think that’s a great point because the people who can game the system, you’ll see them make it through the application process, and the people who don’t know how to game the system, you never see them. Is that really who you want to be hiring? People who can game the system? I suppose it tells you something about people, but it doesn’t tell you much about who has the requisite skills. Knowledge@Wharton: And it doesn’t tell you much about character or the ability to manage yourself or anything like that. Cappelli: The things that employers say they want. Knowledge@Wharton: You also blame the press for preferring to write stories with headlines like, “Companies Have Trouble Finding Skilled Workers,” as opposed to “Companies Ecstatic over New Hires.” But the press isn’t likely to change. I don’t see them getting any more analytical or in-depth. So, how does one get the true facts out there? Cappelli: Well, it was a real puzzle to me — which is partly why I wrote this book — that you would see so many of these anecdotal stories, and then in Washington, you would see so many people picking up these stories and assuming that this is what’s going on in the economy as a whole. Basically what I do in Why Good People Can’t Get Jobs is look at some of the real data. And when you look at the data, you can see that there’s really no truth to any of these claims. You can see that employers are not doing what these anecdotes suggest, for example. What I hoped the reporters would do is just ask a couple of questions. Employers, when they say they’ve got a skills gap, that there are no applicants out there who meet their needs, they are self-diagnosing the situation. What’s really happening is they’re just not able to hire, but you don’t know why that is, right? And the skills gap story is their diagnosis. It’s basically saying there’s nobody out there, when in fact, it turns out it’s typically the case that employers’ requirements are crazy, they’re not paying enough or their applicant screening is so rigid that nobody gets through. Knowledge@Wharton: I was intrigued by a comment in your book that every generation thinks it has experienced this profound technological change. But then, as you point out, imagine witnessing the rise of widely available electricity, telephones and cars all in the same decade. You say that there’s no evidence that our current period — as computer-driven as it is — is on a different scale. But that seems hard to believe, given recent transformative changes in healthcare, nanotechnology, robotics, etc. Cappelli: The real question is: Is there something that’s happened to jobs that makes the skill requirements go up so much that we would think there’s this mismatch? And you know, there are always some jobs that require some new technologies. There are always some jobs that don’t. If you look at the array of jobs in the U.S., the ones that are growing and shrinking, you see two poles: There are some high-scale jobs that are increasing in demand, and there are some really low-scale jobs like health care, home health care workers, which are really increasing in demand. Overall, there’s just not that much change. There’s nothing systematic that’s cutting across all jobs. We talk about computers and IT being so important now. But you know, personal computers came to the office 30 to 35 years ago. So, you ask, when was the first time anybody can remember not having a PC on their desk? Well, there are people who can. But for most workers now, they can’t. Computers have been there for a long time. I think we’re fascinated by the fact that young people seem to be on their BlackBerrys or their iTunes all the time. But if we think about how older folks used technology, it’s really the same, right? The difference is just that young people are talking to their friends 24 hours a day, and we talk to our friends kind of rarely. So, it’s not that the technology is different; it’s just that [young people] are more intensively using the things that we’re paying attention to. But we use them, as well. Knowledge@Wharton: What about the claim that our graduates are less skilled and qualified than foreign counterparts? You cited an OECD report showing that U.S. students are about at the middle of industrialized companies. But you also say that’s partly because countries in Asia, for example, are catching up to the U.S. in terms of education and job training. Still, is it something the U.S. should be worried about? Cappelli: I think this narrative we were talking about earlier — about skills gap problems because schools are failing — is powerful because there’s a view in the U.S. that schools are failing. That’s not true on average. Schools have been slightly better over time for the last 20 years. There are still some terrible schools in the U.S. They get all the attention. But the story in the U.S. is really one about variants. There are terrific schools, and there are terrible schools. When you compare us to countries in the rest of the world, we are about in the middle, and we’ve been roughly there for a while. Among the top five countries or cities for student academic achievement in high school are Singapore, Shanghai and Hong Kong. So, if you look at our competitors in Europe, we’re about in the middle. The difference is that many more people go to college in the U.S. than in most parts of the world. So, the typical employee of the U.S. has more education than in most countries. Some people argue that we don’t have enough education, and you know, I suppose you could always make those arguments about what is enough. But again, the simple point is that employers are not complaining about a lack of academic skills among job applicants. And employees and students, in particular in the U.S., are killing themselves trying to figure out which career tracks will give them jobs, which majors will give them jobs. There’s this belief that we don’t have enough STEM graduates — science, technology, engineering, math. Some engineering jobs are in hot supply now, but five years ago they weren’t…. So if you’re entering one of these engineering fields, you’re really making a bet about whether it happens to be hot the year you go on the job market. If it’s not, you’ve got the same problem as everybody else, and you’ve got the additional problem that those skills go out of date very quickly, especially IT degrees. So, the idea that you’re going to have a career as a computer programmer, for example, is probably not true because your skills become obsolete. You’re pushed out, and you’ve got to figure out how to get retooled. It’s very difficult for math majors and science majors to get jobs in math or in science. If you look here at Penn, for example, most of our students with those majors end up doing consulting and investment banking. So it’s not the case that the industry is clamoring for math majors and biology majors and they just can’t find them — that’s not what’s going on. Knowledge@Wharton: The subtitle of your book — The Skills Gap and What Companies Can Do About It — suggests there are solutions to these issues. You’ve touched on this already. But if you had to pick two or three things that could alleviate this problem, what would they be? Cappelli: If I were an employer, I would first begin — actually, I put this to a group of CEOs just this last week — to ask if I know what it’s costing me to keep a vacancy open. It’s got to be costing me something. Do I know what it’s costing me to train somebody versus hiring somebody and chasing them on the outside? If you have answers to those questions, you start realizing that it does cost something to keep vacancies open. Searching forever for somebody — that purple squirrel, as they say in IT, that somebody who is so unique and so unusual, so perfect, although you never [find] them — that’s not a good idea. So, maybe we ought to revise our hiring requirements and just get somebody in there and start doing the job. Could we figure out ways to train people so that we could make money on it the same way that accounting firms do and that craft unions used to in terms of trade skills? Can we figure out what makes sense for us rather than just going with our gut? Because our gut is probably wrong. We’ve just got to keep waiting until we find the purple squirrel that we can’t train, so that we can’t give people time to get up to speed? Why don’t we consider other options? It just doesn’t make any sense not to. Knowledge@Wharton: And lastly — what would you advise employees? Cappelli: I think the first thing is to remember that if you’re looking for a job, to a large extent it’s not your fault that you don’t have one. There just aren’t enough jobs for the number of people looking for them now; the shortfall is enormous. So, don’t take it personally if you can’t find a job. The second thing is, given the way the system seems to work now, and particularly how automated things are, the best advice — which is not new advice — is to see if you can get around [the automation], see if you can get to a real person where you can make the case about why you have the skills in ways that may not be completely obvious from your resume. It always helps to put yourself in the shoes of hiring managers who understandable want to minimize their risk — and want to find somebody who is really motivated to do the job. See if you can make that case to them.